Introduction On the night of May 21, 1972, a frail, bald, eighty-two-year-old trouper enters from the wings of Carnegie Hall and takes center stage. He has not performed in New York for some fifty years, and in that time he has risen to the status of pantheon figure. He has been on the cover of Time twice. Scholars have written Ph.D. theses about his humor; his remarks have appeared in H. L. Mencken's The American Language, as well as in Bartlett's Familiar Quotations and The Oxford Dictionary of Quotations. Whatever awards broadcasting has to offer he has won. He has been impersonated by George Gershwin, made the subject of a Broadway musical, feted in London and Paris. The French government has just invited him to Cannes, where he is to be made Commandeur dans l'Ordre des Arts et des Lettres. Ticket holders have become used to him as an ageless two-dimensional black-and-white figure. They have to get used to him as a man -- especially this man. For arthritis and small strokes have made his missteps a parody of the old choreography, and his rheumy eyes can barely decipher the cue cards. All the same, he seems to occupy the entire hall, and 2,800 onlookers, some of them sporting clawhammer coats, greasepaint moustaches, and oversize cigars in homage to the speaker's signature costume, rise to their feet and applaud for nearly five minutes. 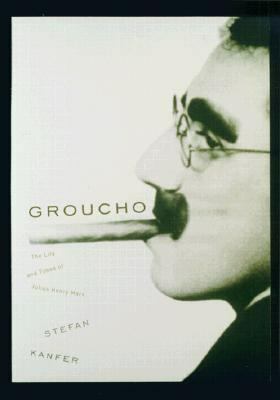 Groucho Marx is no longer in full control of his body or his memory, but his fans have decided that these infirmities are irrelevant and unworthy of comment. As he sings and reminisces in a broken voice, senior members of the audience look past old age to see the springy vaudevillian of their youth, playing straight man to his brother in a schoolroom routine: What is the shape of the world? I don't know. Well, what shape are my cufflinks? Square. Not my weekday cufflinks. The ones I wear on Sundays. Oh. Round. All right, what is the shape of the world? Square on weekdays, round on Sundays. What are the principal parts of a cat? Eyes, ears, neck, feet. You forgot the most important. What does a cat have that you don't have? Kittens. Middle-aged fans are more familiar with his celebrated stage lines, supposedly launched when one of his brothers tried to throw him off stride: The garbage man is outside! Tell him we don't want any. I'd like-a to say goom-bye to your wife. Who wouldn't? In their minds the past fuses with the present, and they recall the outrageous comedian of some forty years before capering in films, walking on half-bent knees and waggling his expressive eyebrows as he insults plutocrats, pursuing or insulting Mrs. Upjohn, Mrs. Rittenhouse, Mrs. Teasdale (all played by the same woman), without missing a diphthong: As chairwoman of the reception committee, I welcome you with open arms. Is that so? How late do you stay open? I've sponsored your appointment because I feel you are the most able statesman in all Freedonia. Well, that covers a lot of ground. Say, you cover a lot of ground yourself. You'd better beat it. I hear they're going to tear you down and put up an office building where you're standing. You can leave in a taxi. If you can't leave in a taxi, you can leave in a huff. If that's too soon, you can leave in a minute and a huff. You know you haven't stopped talking since I came here? You must have been vaccinated with a phonograph needle. They recall his annihilations of high society ("The strains of Verdi will come back to you tonight, and Mrs. Claypool's check will come back to you in the morning"), the campus ("But Professor Wagstaff, if we tear down the dormitories where will the students sleep?" "Where they always slept. In the classroom"), the medical profession ("Either this mKanfer, Stefan is the author of 'Groucho: The Life and Times of Julius Henry Marx' with ISBN 9780375402180 and ISBN 0375402187.